This wreath is more than just a welcome sign as guests enter our home through the garage. It is a statement. We bought the sign years ago when our daughters were younger and I guess I secretly hoped it would encourage our girls to believe in Santa forever. I loved all the Santa magic…the letters, cookies and milk (and one year cheese because Morgan saw it on TV ), the pepper-soot footprints left behind from Santa’s delivery of gifts on Christmas morning and the secret key to the door when our new house did not have a chimney. Oh how fun it was. And the memories still remain fresh as ever. But now THIS HOME BELIEVES sign has a deeper meaning. I added the wreath and embedded the sign within. As we grew, both physically and spiritually, we see now that it means this home believes in the birth of Jesus, the real meaning of Christmas. It means we believe in miracles and answered prayers; in healing and hope; in love and forgiveness; in faith and family and friendship and God’s richest blessings. 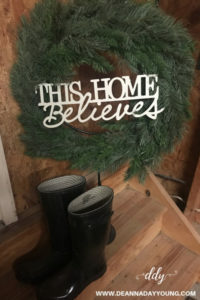 Yes this Christmas season, our home believes. This entry was posted in devotional, inspirational, motivational, spiritual on November 27, 2018 by Deanna Young.